With so many changes and challenges before us, we wanted to take a moment to share about a special blessing that has come our way. We see this as another reminder of God’s faithful provision and His continued desire to use FCAP for His glory in the days to come. Many years ago, a dear friend of Joe’s, Byron DeVore, presented us with the special gift of an integrated phone system for our office. That system has served us well for many, many years. However, several months back we began having major problems with the answering system connected to these phones. It became obvious it was time to pursue a more updated system as service for this particular one was no longer available. One local phone installation company came highly recommended through several other non-profit organizations. The quote they gave us for a used, but more up-to-date, system appeared to be a very reasonable and would fit our current budget. So we proceeded to schedule the installation. Then one day, Tim, owner of the phone installation company, sent us an email. 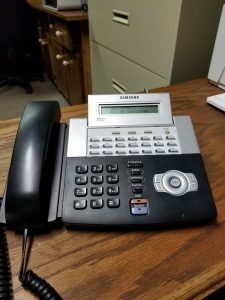 When the business selling the phone system to them learned that we were non-profit, they made the decision to donate the system to us, and the phone installation company followed suit regarding installation costs. Bottom line is this … we now have a “new to us” system installed at no cost to us. The system includes 7 phones and the connection box. It is so much easier to operate than our older system and also has additional features we will certainly utilize. We anticipate the system serving us well for a long time to come. For this gift to the FCAP ministry, as well as the gift of our earlier system through Byron (who is now with the Lord), we are so very grateful. Hope hearing about this provision encourages you as much as it does us!